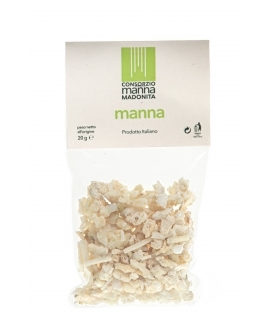 “When Manna Doesn’t Fall From the Sky” was born with the invaluable support of the Fondazione con il Sud (Foundation with the South)This ambitious project is working to re-establish manna production in local ash groves, a typical crop of Castelbuono and Pollina, in north-central Sicily. Manna in the Madonie Mountains doesn’t fall from the sky but flows from these ash trees, generating a unique resource with beneficial qualities and the possibility for economic stimulation and job creation. Manna’s redevelopment shows how respecting an area’s biodiversity can also make economic sense. The project aims to reclaim the region’s abandoned ash groves. In its initial phase, older manna producers will share their knowledge and skills with younger generations. 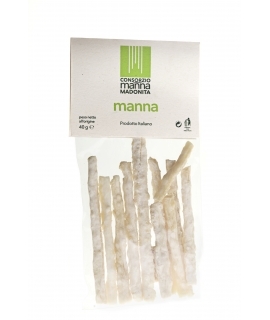 A consortium will handle the annual production and sale of the manna they harvest. .
To support the commercialisation phase, the project includes activities in research, marketing, promotion and distribution: Innovation in the service of traditional knowledge. Sixty hectares of ash groves will be put back into production. The hope is to create eight new jobs and continuing employment for 20 agricultural workers. Lots of enthusiasm animates the project, and as we know, nothing big can happen without enthusiasm! The incision of ash trees is an art now practiced only around Pollina and Castelbuono, where the land, the unique climate and the energy of its remaining producers continue to keep manna alive. Manna is born from incisions that “mannaruoli,” the harvesters, make on the trunks of ash trees when conditions are favorable. Transparent sap slides slowly from incisions, condensing and crystallizing on contact with the air into sweet, white “cannoli” of precious manna.